Edinburg High's John Henry Gonzalez pitches the ball against Edinburg Vela during the second inning of their game Friday March 4, 2016 at the La Joya Tournament. As Texas Tech’s trip to Edinburg for a matchup against UTRGV drew closer, John Henry Gonzalez started to hear the rumblings from excited family and friends. A sophomore pitcher for the Red Raiders, Gonzalez may have the chance to play in front of his hometown supporters for the first time since his days at Edinburg High when Texas Tech faces UTRGV at noon Monday at UTRGV Baseball Stadium. With the unusual afternoon start time on a weekday, Gonzalez said a couple of friends and family members have told him they plan to take the day off or get out of work early so they have the opportunity to see him in action once again. Gonzalez said on Sunday he expected to have only a few hours of downtime in Edinburg after Tech’s series against UTSA was delayed a day, concluding on Monday rather than Sunday. The Red Raiders picked up a 10-6 win against UTSA after a noon first pitch on Monday, then boarded the bus to Edinburg. Whether Gonzalez will have the chance to pitch against UTRGV is unclear. He’s slid into a bullpen role this year and was not used during Tech’s sweep of UTSA. Tech has been one of the juggernauts of college baseball this year, undefeated at 8-0 and ranked third in the latest National Collegiate Baseball Writers Association poll. As a result, Gonzalez has faced stiff competition for playing time, with eight of the team’s 10 leaders in innings pitched from last season returning for 2018. Gonzalez has made just one appearance this season, throwing a scoreless inning allowing two hits with two strikeouts against Maine on Feb. 17. As a freshman last season, Gonzalez made 13 appearances, including nine starts, and posted a 2-3 record with a 6.52 ERA. In 38 2/3 innings, he gave up 44 hits and 33 walks, striking out 28 batters. Gonzalez said a strong fall semester as a freshman allowing just one or two runs all season helped him land the role of midweek starter — typically the No. 4 pitcher on a team’s staff. When ace Davis Martin was lost to tendinitis, Gonzalez was tabbed to start a trio of Friday conference games — against Oklahoma, Baylor and Oklahoma State. Gonzalez said he thought he could have done more with the opportunity, adding that the moment got the best of him. Between the three outings, he lasted eight innings, giving up five earned runs on 10 hits and eight walks with three strikeouts. He chalked it up as a learning moment — one of many from his first season as a Red Raider. Gonzalez said he’s grown as a pitcher. During the fall, he ran his fastball up to 92 or 93 miles per hour, he said, and he rounds out his arsenal with a slider and a changeup. His changeup, especially, has become more potent and reliable. He said both of his strikeouts in his lone outing this season came off changeups. 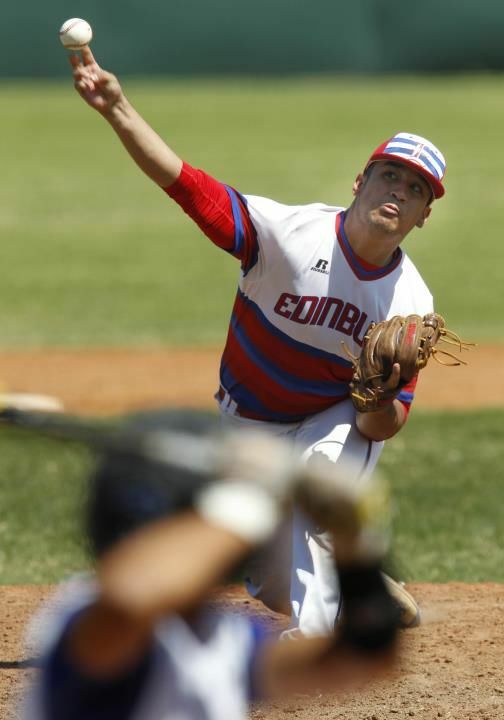 At Edinburg High in 2016, Gonzalez posted a 9-0 record with a 0.89 ERA and 109 strikeouts against 31 walks in 63 innings, earning The Monitor’s All-Area Pitcher of the Year honors. For his Bobcats career, he was 21-3 with a 0.74 ERA and 261 strikeouts in 152 1/3 innings. He considered turning pro out of high school and discussed the possibility of being selected by the Tampa Bay Rays somewhere between rounds 11 and 15 in the 2016 Major League Baseball draft. Hoping for a selection in the top 10 rounds, he opted instead to accept a full scholarship offer from Tech. He had signed in November 2015 after being offered during the previous fall.